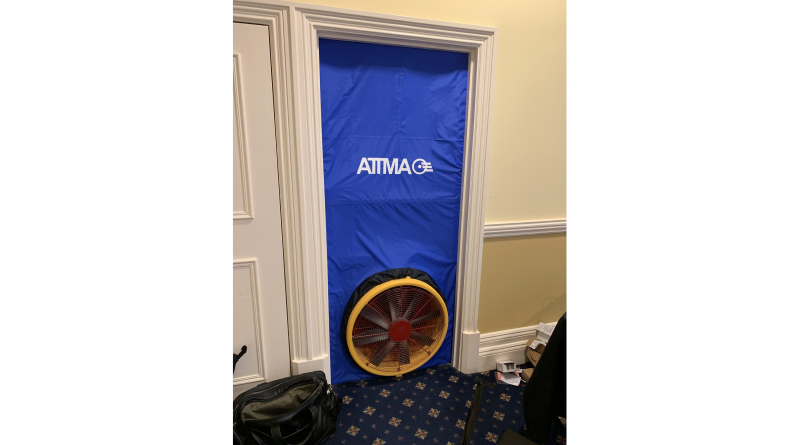 BCTA ATTMA is delighted to be able to offer custom ATTMA door templates for single fans as demonstrated at the BCTA ATTMA SITMA 2019 AGM. The templates, available exclusively through the BCTA Shop, come in a range of colours (red, blue, yellow and olive green) and most impressively, with the option for YOUR company logo printed on them, alongside the ATTMA logo. The fabrics, are also available in both standard ‘big fan’ sizes, for Retrotec 1000 series through to the 6000 series, and also for the Model 3 & 4 Energy Conservatory fans. They can also be made for smaller ‘Ductblaster’ style fans. Barry adds “Perhaps the biggest opportunity is for marketing images. At ATTMA, we see a lot of brilliant pictures of impressive buildings being tested. Adding your company logo and colour into the doorway adds a new dimension, and protection, to your images!”.